How Will The First 3D Laptop Change Gaming? I'm all for technology advancements--a new OS, a slicker smartphone, Tang, whatever. Now Acer's making an odd-but-interesting bet with its new Aspire 5738DG laptop: a 3D display. Yep, the future is now--watch out for flying DeLoreans! Before I crack any more jokes, let me explain what goes into Acer's 3D technology. Ray Sawall, senior manager of product marketing for Acer America, took a few minutes to break it down for me. Forget fancy proprietary names (TriDef 3D screen! ), what's at work here are polarized plastic shades, a 60-Hz polarized display, and software working in tandem to trick the image into seeming three-dimensional. With 3D movies (like, say, Monsters vs. Aliens), it works. It also does the best it can to represent 2D images in 3D. I haven't had a chance to test it just yet, but the spokespeople say I need to check out The Lord of the Rings--and I will soon, since I expect to see a review unit any day now. 3D: Must-Have Tech, or Gimmick? Obviously, the big deal here is what this could mean to gamers. I should know; I'm a card-carrying member. The video game crowd's been chasing that 3D dragon for ages, with some of the best results coming from real-time strategy titles like Command & Conquer 3. Most recently, Resident Evil 5 is a great example of what 3D can do to make the action jump off the screen. Or maybe Excel spreadsheets will come alive as you get lost in cells--exciting, I know. Is 3D too much of a niche gimmick? I'm inclined to think so. 3D seems to be the new rationale to sell movie theater tickets, special-edition Blu-ray discs, and apparently PC hardware. Even Acer's Sawall seems to agree: "My gut is that [touch-screen technology] has more traction than 3D. Honestly, I'm not sure if there's a home for 3D in mobile." Still, Sawall says the Aspire 5738DG's been better received by retailers than expected. The Aspire 5738DG, available later this week with Windows 7 Home Premium 64-bit edition, packs decent hardware for the $780 asking price: an Intel Core 2 Duo processor T6600, an ATI Mobility Radeon HD 4570 GPU, 4GB of RAM, and a 320GB 5400-rpm hard drive. Stay tuned and I'll give you the skinny on how well this machine works when I get my hands on it. What are your thoughts? Substance, style--or something in-between? 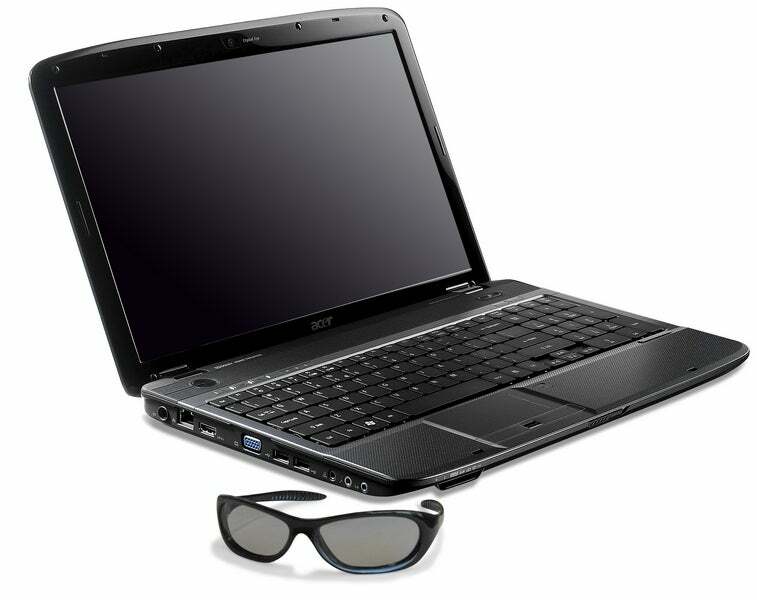 Hit the Comment box below or send e-mail to PC World with "ATTN: Laptops (3D? I can barely handle two dimensions)" in the subject line. Need even more nerdity? Follow PC World Senior Writer Darren Gladstone on Twitter (gizmogladstone) for oddball links, 140-character game reviews, and whatever else comes to mind.